Republicans Have God On Their Side: Remember this? 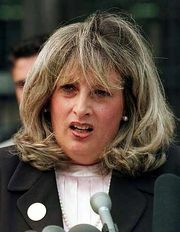 Linda Tripp was a White House employee in the George H. W. Bush administration, and kept her job when Bill Clinton took over in 1993. During the summer of 1994 senior White House aides wanted Tripp out, so they arranged a job for her in the public affairs office in the Pentagon which gave her a raise of $20,000 per year..
On January 19, 2001, the last full day of the Clinton Administration, Linda Tripp was fired from her job in the Pentagon . Tripp claimed that the firing was vindictive, but the Clinton administration countered that all political appointees like Tripp are normally asked to submit their resignation upon a new administration taking over, and those who refuse are fired. Tripp's attorneys Kohn, Kohn & Colapinto, the top law firm in Washington, D.C. defending government whistle blowers, issued the following response: "The termination of Linda Tripp is vindictive, mean-spirited and wrong. President Clinton should not have ended his presidency on such a vengeful note." Tripp had retained the firm to sue the government for violating her rights under the Privacy Act of 1974 when the Clinton Administration leaked confidential details of her employment record to the press.